When I think of the experience I’ve just had it conjures up many familiarities classic fast food, no frills, brown paper bags and gallons of Coca Cola Syrup. That said my experience wasn’t cheap, a key factor I associate with this breed of ‘restaurant’. 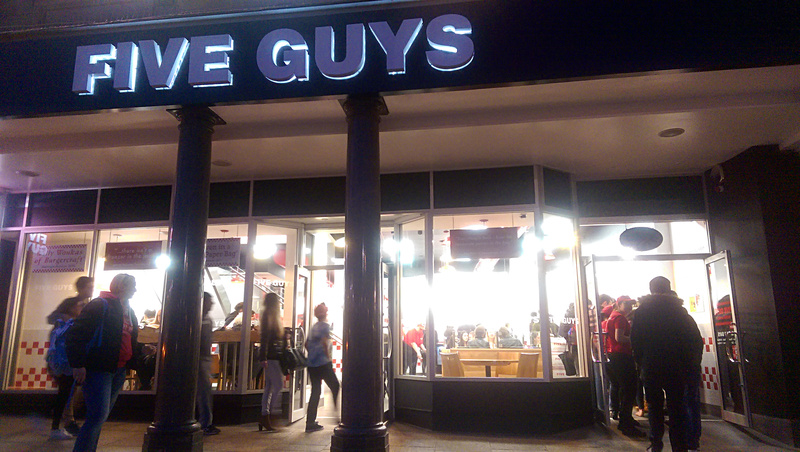 From reading the posters I can tell you that the, now huge, Five Guys empire was started from a single store in Virginia, before starting to make it big in Washington. It has a growing presence in the UK, Nottingham the latest outlet, having opened on Monday. The place itself has a hint of American diner about it but with its own unique style, quite clinical with the red and white tiles. I joined the modest queue at 1830, though by the time I left it had just about extended out of the door. The ‘menu’ was explained a little poorly as I arrived… though the concept is pretty straight forward. There are sandwiches and dogs but burgers are clearly what you’ll want to hear about. A little burger translates to a single burger, a burger translates to two burgers. Clear? I wasn’t. The wider concept is that there are 15 toppings to adorn your patty with at no extra cost. Of these I chose jalapenos, peppers, fried onions and relish. 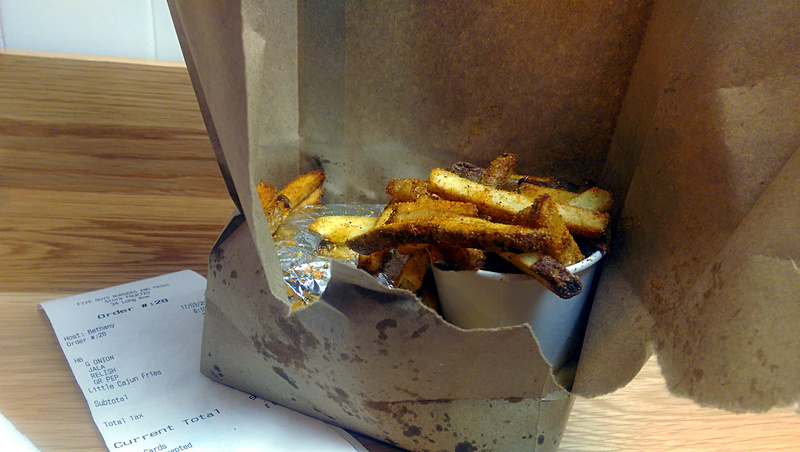 Some Cajun fries were the obligatory carby accompaniment. There was a serious production line in the open kitchen and the team were coping well with the high demand, I’ll estimate a 5 minute wait. The first impression of the food was the powerful smell of the Cajun fries. I was a pretty big fan, these skin-on potatoes were spicy little numbers with just the right amount of crunch. I do feel that the problem with a make-your-own burger is that you can end up with something terrible. Fortunately I had the wisdom not to put HP sauce and lettuce together, but I’m not confident I picked the best combo. My creation lacked something a little substantial like the usual salad garnishes, I’ll know for next time! 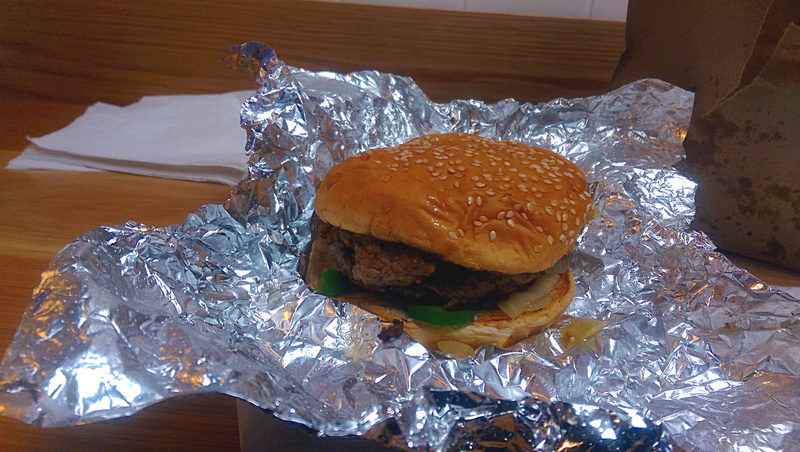 The beef patties themselves were rather good, remaining really moist and it was generally a pretty strong burger. My disappointment about other burger places in Nottingham is that they mess around with too many weird toppings, here the beef was good and I was glad I could taste it! The crux of the evening was pricing. If you have a cheeseburger (double but single remember), small chips and a coke you’re looking at the best part of £15. In a recent post on fast food I wrote about one of my guilty pleasures, Roosters Piri Piri. There the equivalent amount of food is less than half the price. I couldn’t help thinking that I’d be reluctant to return in favour of cheaper fast food or a proper meal somewhere else.